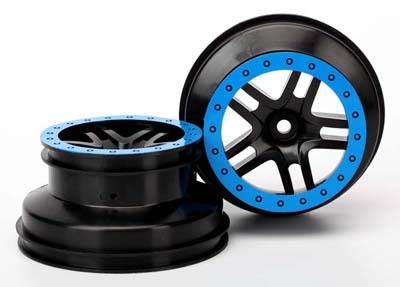 Traxxas - Black/Blue Split Spoke Wheels for Slash Discounts Apply ! TRA5884A - Traxxas - Black/Blue Split Spoke Wheels, 2.2 x 3.0 for Slash 4WD F/R and 2WD Rear only. 1 Pair.